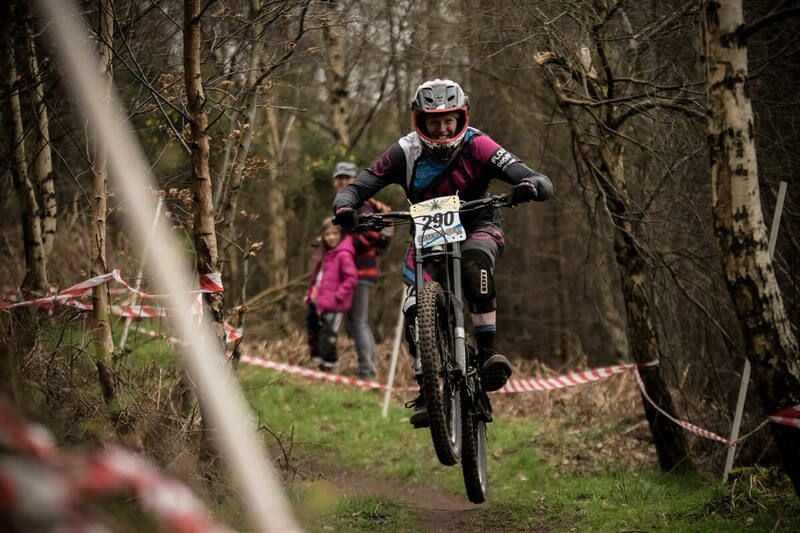 It was the last race of the Winter Series at Stile Cop but my first race on my new steed – a proper downhill bike, first time I’ll be using it too! I jumped in my van and cranked up the engine. Hhmm hang on – it’s race day and there’s no windscreen to defrost, no rain splatter to wipe away and I can actually see some blue in the sky!! What’s all that about?! Makes a nice change hey! A&E (yep sounds worrying) was the track to be raced and the last section of this joined up with the Red Run that was used on my first race here at Cannock. The track starts off by dropping into a nice smooth right hand berm over a couple of small jumps and then splits off to the left of the hill where the track becomes twisty, narrow and steeper. The ground feels very soft and loose underneath so you can really slide into the turns. After two sizeable and awkward step downs – the first leaving you looking, and me heading towards, a tree the track then opens out over a double into the middle section of the track. The ground becomes a lot firmer with larger shiny pebbles and roots so as you’re hitting the corners at speed there’s always the risk of a front wheel wash out. It certainly keeps you on your toes! You need to try and keep enough speed on this middle section to clear a gap jump before crossing the fire road and joining up with the last part of the Red Run. Another little jump into a tricky left hander with plenty of braking bumps and a tight sharp right trying to keep a high line to hit some sizeable roots before another sharp left turn over a single crafty root to the finish line! Phew! It’s a short track but boy are your lungs bursting at the end of it, especially trying to find those last few pedal strokes to get you over the finish line. After having a few practice runs down the track I was feeling good. My team mate Rebecca and I had a few issues with a small tree stump in the middle section. Rebecca careering toward the stump unable to swerve she does a nice hop over it, style!! – I found this highly amusing but soon realised I was heading for the exact stump and opted for the hope and flinch approach – I’m not such a cool kid haha! I must remember not to focus on said stump in the race run! The last practice run we led a young lad who was having trouble with the top section, if we could persuade him to follow us down hopefully he would still take part in the race. As soon as we got to the first step down the marshall’s recognised the lad and the support was brilliant, cheering and willing him on down those steps made me smile. It really shows you what racing is all about. Yes we’re racing against each other but you’re still united! And yes the lad did take part in the race – mission accomplished! After a small break in the sunshine and a much needed drink we were soon lining up ready to start the race. As soon as I hear those starting beeps my belly goes whoop with nerves and excitement. I shouted Rebecca off for her first run down and lined myself up ready for my turn. Setting off, some familiar voices cheered me on and I really nailed the top twisty section. After coming out over the double I hit the first right hand bend and took a front wheel slip – this made me stiffen up a little on the bike and I lost a fair amount of speed. I cranked the pedals and just about managed to clear the gap jump. Keeping the power on for the last section I knew I had lost a fair bit of time. It’s such a short track any mistake will have a big impact on your result. I came in at 1 minute 14. I managed to drop 2 seconds off my second after another loose moment in the top section – I think I went a little too much all guns blazing! 1 minute 12 was enough to put me in 3rd behind my teammate Rebecca. And 4 seconds from the race leader was a great improvement for me so I was really chuffed especially getting on the podium, happy days! I’ve really enjoyed the winter series at Cannock. Mick and Harry are great even if they do tease me over constantly over the need for the toilet keys! The atmosphere was brilliant and there was a real party feel with Bob Marley playing from Harry’s car near the start line. I’m looking forward to the summer series at Stile Cop – I hear the tracks used will have larger features (all rollable if need be) so will be a good challenge and improve my skills. Thanks again to my sponsors Flow MTB and to the team at Cannock for putting yet another great race on! Also like to thank Prospect Visuals for the shots – my face looks like I’m having far too much fun!